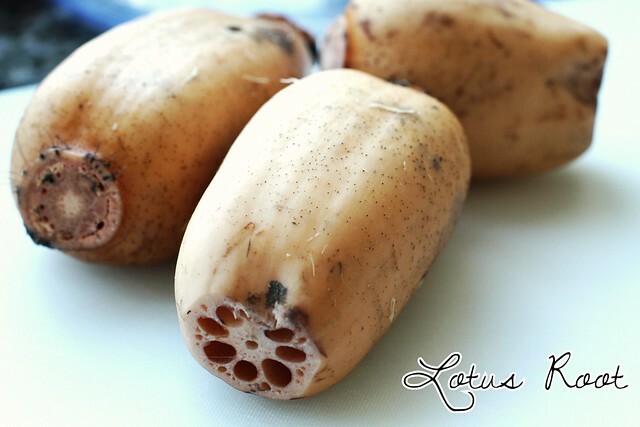 If you haven’t tried lotus root, it’s starchy yet retains a crunch, giving it a texture that resembles a meatier water chestnut. I should point out that I really like lotus root and I’m not such a fan of water chestnuts. 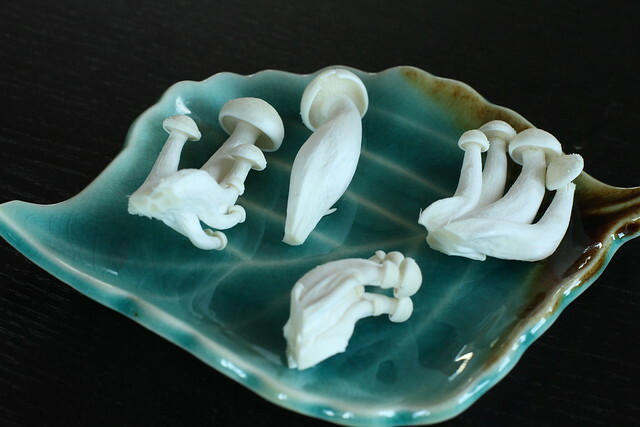 Perhaps you haven’t cooked some of these mushrooms before either or soy bean skin. Don’t worry. It’s really very easy. Follow the simple instructions, making sure to prepare all the ingredients first — mise en place! — and you’ll be fine. You probably won’t find most of these ingredients at your local supermarket. However, all of them are staples at Chinese supermarkets. Put in the effort for that special vegetarian or vegan friend. They’ll love that this medley is salty and sweet, with a nice variety of textures and flavors, and includes a solid protein, soy bean skin. Served with rice, it’s a perfectly complete meal. 1. Soak shitake mushrooms in warm water until softened, at least 1 hr, up to 6 hours. Drain, squeeze out excess liquid, and quarter the mushrooms. Set aside. 2. 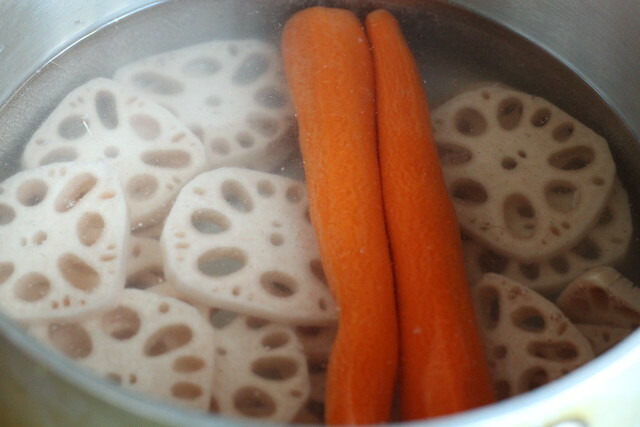 Place lotus root and carrots in a medium sized pot of salted water and bring to a boil. 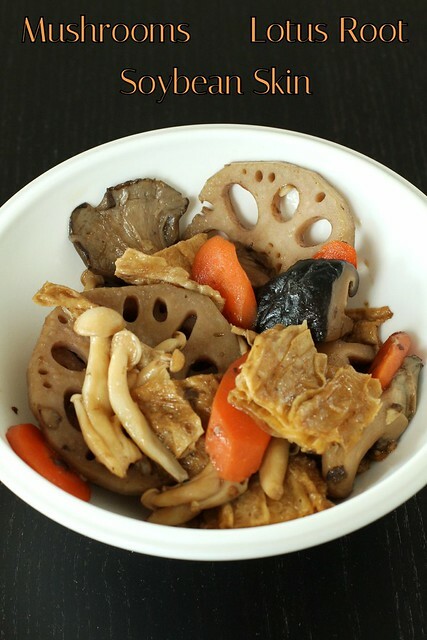 Reduce to a simmer and cook until the lotus root starts to change color, about 5 minutes. Drain and set the lotus root aside. Rinse carrots under cold water so you can handle them. Cut them into 1/4″ slices on a bias. Set aside. 3. Remove beech mushrooms from the package and cut off the bottom and discard. Break into small clumps and set aside. 4. Heat vegetable oil in a wok on medium heat. Add oyster mushrooms and stir-fry for 2 minutes. Add shitake mushrooms and stir-fry for another minute. Add beech mushrooms and stir-fry for another 2 minutes. 5. Add vegetarian oyster sauce, kecap manis, and garlic. Toss until well distributed. Add soybean skin and 1 oz water. Toss and cover. Turn up to medium-high heat and cook for 2 minutes. 6. Reduce to medium heat. 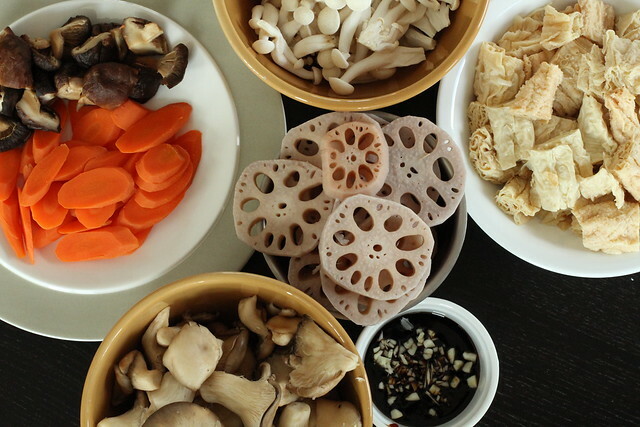 Add lotus root and carrot, stir-frying to combine. Add 1 to 3 oz of water as needed while stir-frying for 5 minutes. *The amount of water needed will vary depending on how high your heat is and also lotus roots will vary in how absorbent they are. You don’t want the bottom of the wok to be dry, just a small puddle of sauce. 7. Add salt to taste and serve. This dish can be served hot or at room temperature. Left-overs can be kept in the refrigerator for 1 week. The left-overs taste great but the lotus root will darken a bit so the dish will not be as pretty. 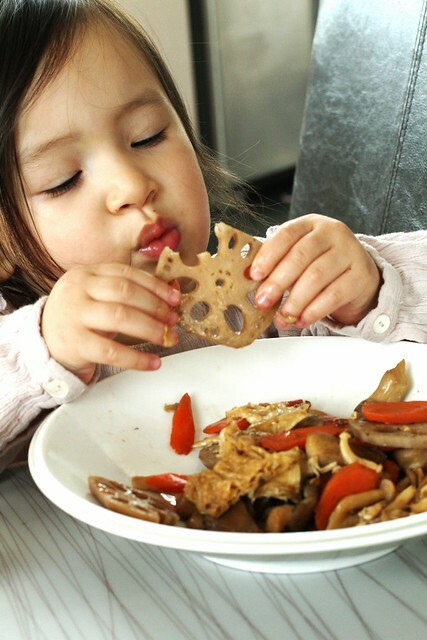 I forgot to mention that Caya loves this dish too! posted by jessica	at 08:39 PM	Filed under Chinese, Recipes. You can follow any responses to this entry through the RSS 2.0 feed. Both comments and pings are currently closed. Oh my goodness…this sounds amazing!! Two questions – would enoki mushrooms work instead of beech? And what does kecap manis taste like?? Aunt LoLo, you can definitely use enoki, just keep in mind that they cook much faster. My mom often changes around which mushrooms she uses. Think of Kecap manis as a thickened sweet soy sauce. Thank you! I grabbed everything at my local Chinese market on Saturday…and this is going to be dinner tonight. Yum!